Picture speaks a thousands words! We often heard or read this sentence and yes…I am completely agree with it. Indeed, one picture which captured the moment could speak thousands unspoken words. I am not a photographer what so ever but I have hobby to capture every moment that important especially for me. Looking back at so many picture that I have taken, I could say that not all of them could touch my heart and telling me a story. When they do, I could stare at them for hours as if someone reads not one, not two but millions words which unfold about a meaningful journey behind each and every one of them. 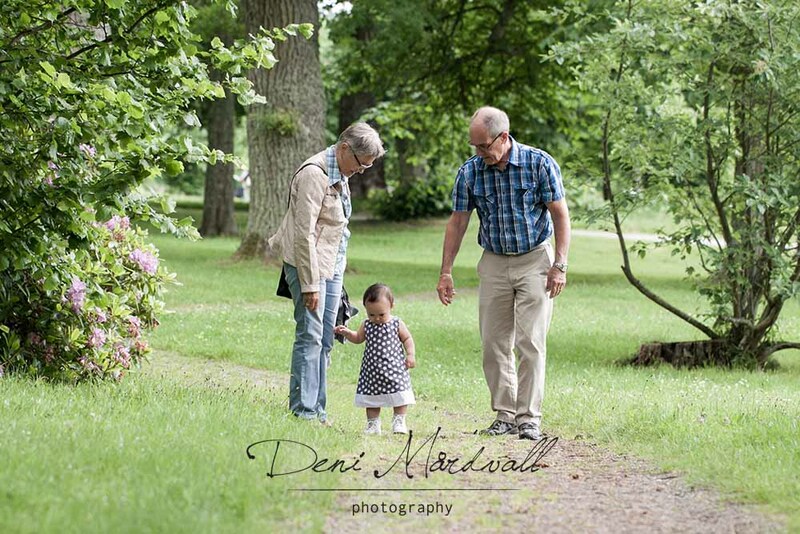 As pictures that I took when our precious A celebrated her very first birthday, they could show how much love, fun and happiness between A and two of her biggest fans, her farfar and farmor. There was no party on the exact day, only a small lunch trip to a castle close to our house. Papa wasn’t not able to join us because he needed to work and not able to get some day off that day. We had great meal inside the restaurant, together wih a couple of golf players and their family. Oh yes, this castle has golf course and in the summer time, there would be quite busy with many activities. As usual, A tried to charm every body and she was talkative during lunch and after our long walk back to the car. We didn’t go inside the castle and decided to let A walked in the park between the restaurant and the car park. 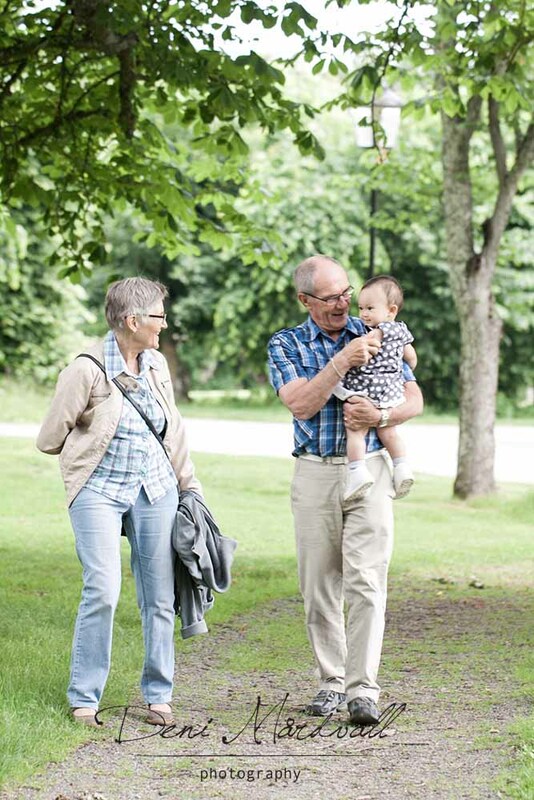 A love to walk since she is able to stand on her feet. She refused to be carried and really fascinated by stones, fallen brunch of the trees around and some of long grass. As you can see that I was busy capturing every movement without asking anyone to pose. I don’t know why I love to take candid shot 😀 I guess by taking candid, everything comes naturally and you got the feeling of the picture itself, catching the moment. Now, when I go through all the picture, nothing is left behind and I love every single shot I took. Because of that, I found myself in a situation where it is hard to choose which one that I want to put here. After many considerations, I decided to pick 5 of many favourites. I made some copy for farfar and farmor so they save it and take a look at it anytime and anywhere. We even print out three the most beautiful ones to put it in farfar’ and farmor’s side table in their bedroom. A brings so much happiness and laugh in our life. We loves to spend time with her, hearing her baby talk, kissing her soft skin, asking her many questions, burried ourselves in her arms, laughing to see her face impression well…as I said so many times, she is our cute clown, she is our sunshine in our cloudy day, she is the one who could make tears become laughter. We feel there are so much love when she is around, we have been blessed to be part of her life and feel grateful to be able to write stories together with her. Time flies, sometimes personally I wish she doesn’t grow that fast but yet I am so glad to have a very active, happy and healthy daughter. Every day we see that A find new skill, new trick and new behaviour to discover the world. It is quite delighted to experience her development every single day. Soon, she will meet my family in Bali. I would be interesting to see how she reacts for the first time she meet them but I am sure that that occasion will be one of those unforgettable moments on our journey. I can’t wait for it to happen. This is another sleepless night for me but hey…it is okay because we are on holiday 😀 Almost 5 and yeah… time to catch up some sleep. We need to get up at 6 and go to town for an appointment. Catch you later! This entry was posted in 2015, Being 38, catatan perjalanan, every day, photography, Tentang A and tagged 2015, catatan perjalanan, family, photography. Bookmark the permalink. I certainly feel the love on this journal, Den. Agnes is so loved and she is blessed with it.